I was enjoying a long (very long) hike over the weekend that brought me in contact with a wide variety of plants and animals. While taking a breather at a ranger station, I was admiring a plant which had what looked to be cherry tomatoes or some kind of red berry sprouting from its branches. The ranger said I was looking at a rose bush and the red fruit it was producing went by the name of rose hips. "Rose Hips" I shrieked. I had known of the supplement for years but had never seen a real live rose hip. 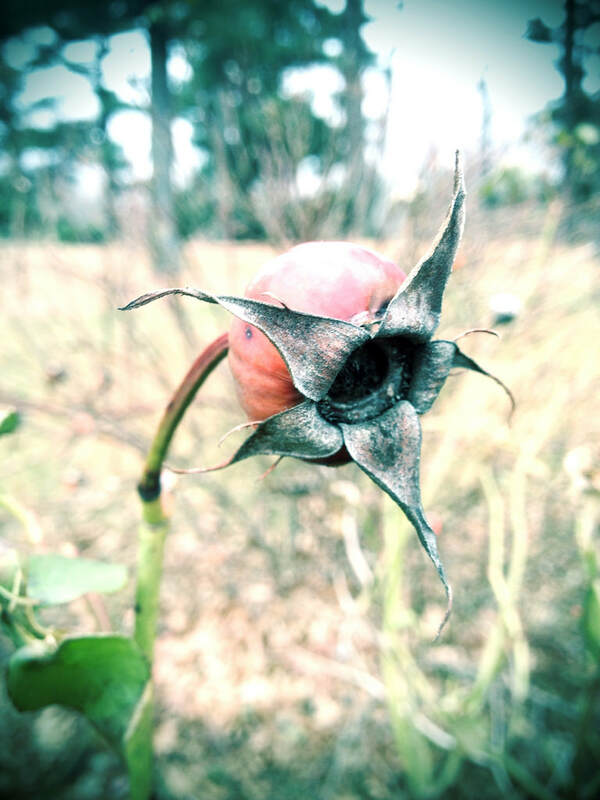 I was informed that rose hips form after the rose bloom has died. Almost any rose variety will produce hips but the ranger informed me that the Rosa rugosa formed the tastiest variety if you planned on eating them. 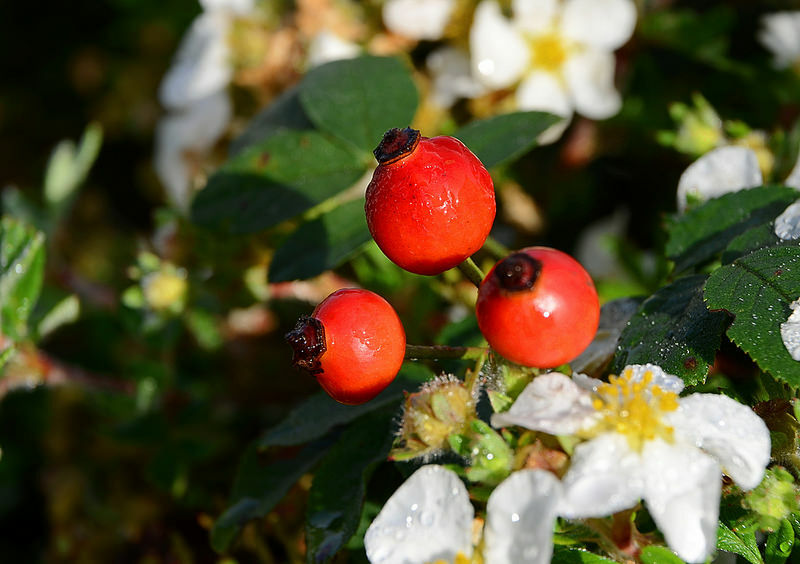 Further research confirmed that Rosa rugosa is the bush of choice for tasty rose hips. 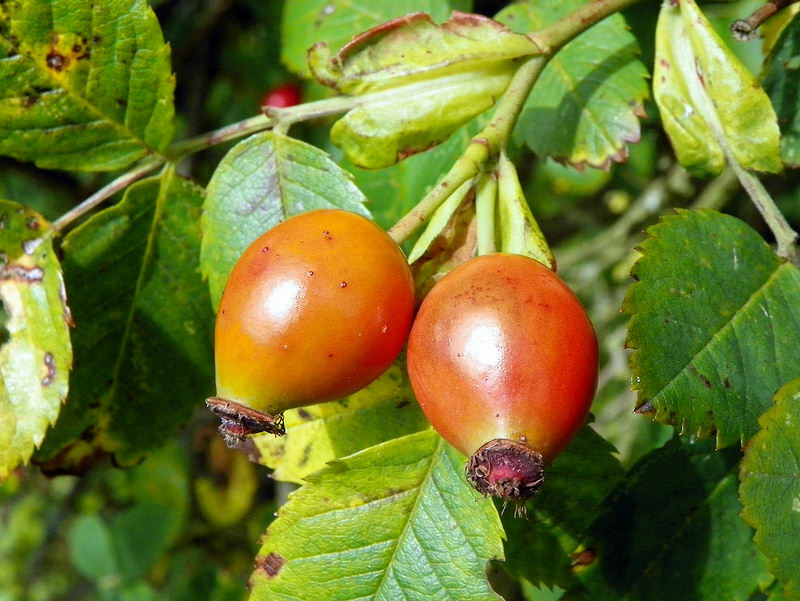 Probably the best reason to eat or drink rose hips is the incredible source of vitamin C that it provides. Studies have shown vitamin C to be helpful with fighting infection, colds/flu, sore throat, fatigue and stress to name a few. Hips provide almost 20 times the amount of vitamin C found in Oranges. How do I Grow Rose Hips? 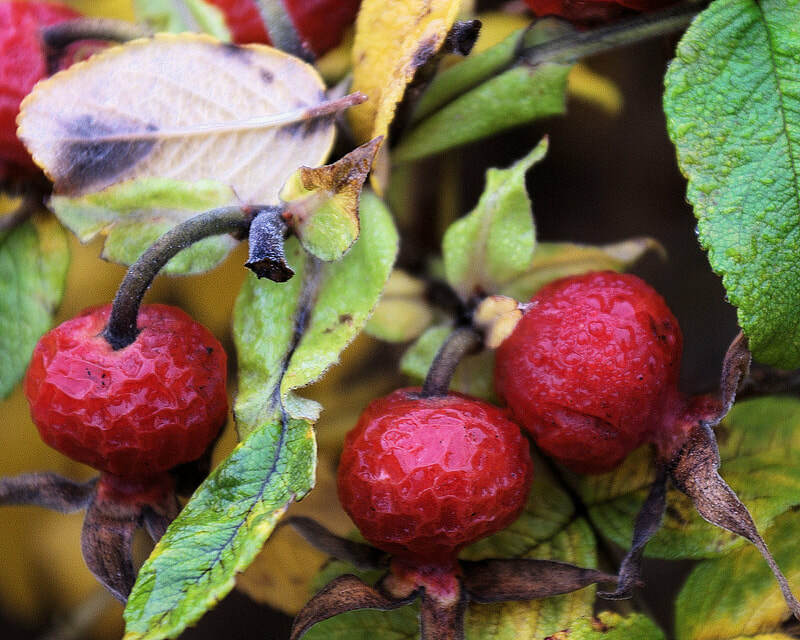 As I have mentioned, there seams to be a consensus that Rosa rugosa is the best plant to use for growing rose hips. Let the blooms die on the bush (resist the temptation to cut the beautiful blooms, the more you cut the less hips you will produce) and the hips will begin to form. They will start out green and begin to turn red similar to the way a tomato ripens. Harvest them when they become completely red but not overripe, this usually occurs after the first frost. You can use rose hips either fresh off the vine, dried, or preserved. To dry the fruit spread the hips out on a clean surface. Allow them to dry until the skin begins to feel dry and slightly shriveled. At this point, split the hips in half and take out all of the seeds and tiny hairs in the center. Remember not to use aluminum pans or utensils as this will destroy some of the vitamin C.
After the seeds are removed you can let the hips dry completely. Don't wait to remove the seeds until hips are completely dry or you will have trouble with de-seeding. Store the dried hips in sealed plastic bags. Freeze for long term use or put in the refrigerator if you plan on using over a two or three month period. Hips can be eaten as a semi-sweet snack at anytime. You can also make tea and preserves; I have listed two recipes below to get you started. 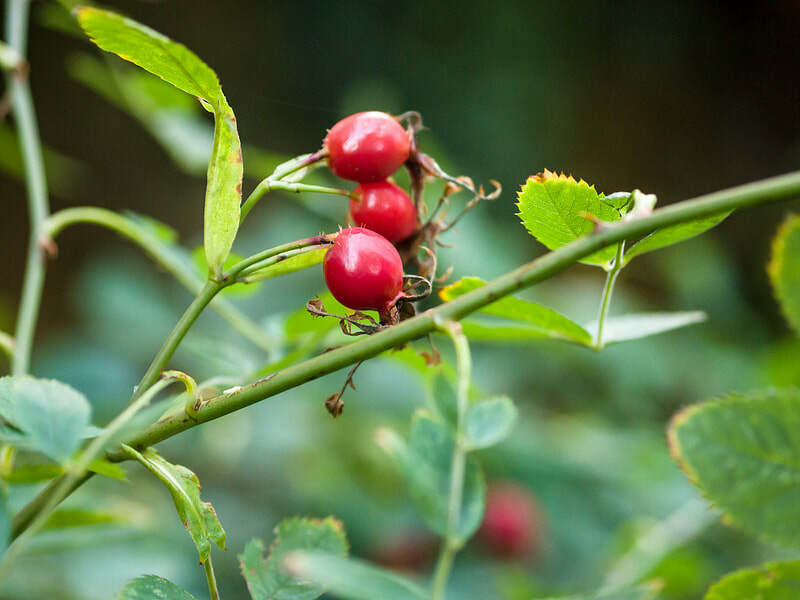 Rose hip supplements are available at most health food and vitamin stores. For me, the fun is in making your own hips. If you just want vitamin C there isn't really a whole lot of difference between taking regular vitamin C supplement and vitamin C with rose hips (except the price, hips will cost a bit more).